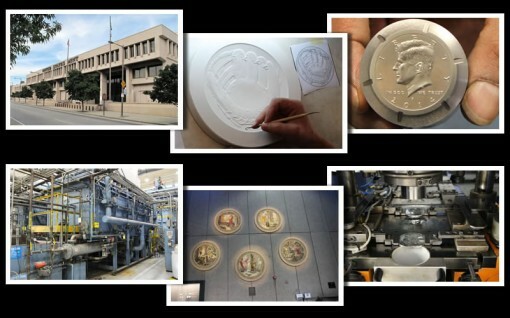 The United States Mint in Philadelphia, Pennsylvania is one of two facilities that produce coins for public circulation. It is located down the street from Independence National Historic Park, a popular hot-spot for tourists. Earlier this month, Mike and Darrin Unser of CoinNews.net went on the public tour and also took a behind-the-scenes private tour of the Philadelphia Mint. The two brothers will publish a series of photos and articles about their trip, but before they do, I asked them three quick questions. Their answers offer insights about what we can expect. What surprised you most about the Philadelphia Mint? Darrin: For me, I would have to say that the sheer size of the operation is what surprised me most. Before arriving, I knew the facility took up a whole city block since I checked it out on Google Maps. That "footprint," however, really is just a small indication of its size when you also factor in the multiple levels and actually start walking through the building’s tens of thousands of square feet. Mike: I have to agree. I expected big, but the complex was huge and the production machines GIGANTIC. It’s pretty impressive to see all that equipment lined up the length of a city block, and then walk down and crisscross both sides. You’d have to pull back the ceiling and get aerial footage of the production floor to really appreciate the scope of it all. Then there were the lower levels… I’m sure Mint security was pleased to learn that we were utterly lost very early into the tour. What did you enjoy most at the Philadelphia Mint? Darrin: Getting a chance to watch the production of America the Beautiful Five Ounce Silver Coins was really enjoyable. For anyone who has not seen one, they are just massive at three inches in size. That large diameter allows for incredible detail of the designs and the fact that they are struck from five ounces of silver gives them an alluring shimmer. Of course, my favorites were the ones depicting Mount Rushmore since South Dakota is our home state, and I’ve had the opportunity to visit the national memorial dozens of times. Mike: Yep, I enjoyed that too. Now we have a story to compliment your wife’s private tour of the Hall of Records behind Mount Rushmore, a place only a few ever get to see. But my favorite part of the tour was watching and talking to some of the sculptor-engravers, like Don Everhart, Joseph Menna and Phebe Hemphill. I designed software years back, and it struck me how simple that was compared to what they do every day. They are a marvel. It was also fun to watch the next stage as Mint employees turn art into working dies using state-of-the-art technology. Then, and I guess you could say it’s silly considering everything else, I thought it was neat to hold freshly minted quarters and dimes that were still warm from the presses. What was most interesting about the Philadelphia Mint? Darrin: The artistry behind coin and medal design was the most interesting section of the tour for me. I’ve always been artistically challenged and struggle to draw a decipherable stick-man. As such, the ability of the incredible U.S. Mint artists just fascinated me. Even though, at times, they are just sculpting (by hand or digitally) another person’s actual design, it still takes a true master of their profession to transform a sketch into a three-dimensional piece of art. Mike: Exactly. And the sheer quantity of designs they create and sculpt was something I didn’t give much thought to before. For me, the most interesting part of the tour was the mechanical magic. It’s cool to watch master hubs and dies get formed, track conveyor belts by the gazillion moving tons of blanks around for pressing, see tens of thousands of coins made in seconds, and then watch how they’re automatically moved and dropped into enormous bags for shipping. I’ve seen coins produced at the U.S. Mint facilities in West Point and San Francisco so I had some idea of what to expect. Still, it’s a lot different inside a plant that churns out billions of coins each year. Stay tuned to CoinNews.net for a series of articles about the Philadelphia Mint. The first one is scheduled for next Friday, August 30. If you have and questions about the Philadelphia Mint, please leave them in the comments section below and we’ll try to get them answered in the upcoming articles. Top photos. A die for a 2014 Kennedy half in August 2013? You think about it, the mint is minting 2014 coins I would say silver coins due to the low price in silver. Silver goes up next year they make huge no ridiculous profits. Also mentioned is the Mount Rushmore 5oz coins. They won’t be released until mid November. Which I would say in my opinion is the best 5oz coin for 2013. Also thanks Unser’s for the tour pictures and information.